gen-E is an IT process automation (ITPA) software company that places human ingenuity at the forefront of workplace activity. The company’s award-winning Resolve™ software breaks down traditional organizational and process constraints through an innovative approach to automation. Powered by actionable and dynamic knowledge management capabilities, Resolve allows organizations to realize cost savings of as much as 200 percent within months of deployment. For more information, please visit http://www.gen-e.com. Solis Capital Partners is a lower middle-market private equity firm located in Southern California. Focusing on leadership and business fundamentals, Solis prefers software, business service, manufacturing and value-added distribution companies in large, highly fragmented markets. Solis consistently has generated superior investment returns through multiple business cycles. The firm is actively investing through its second fund, Solis II. For additional information, see http://www.soliscapital.com. 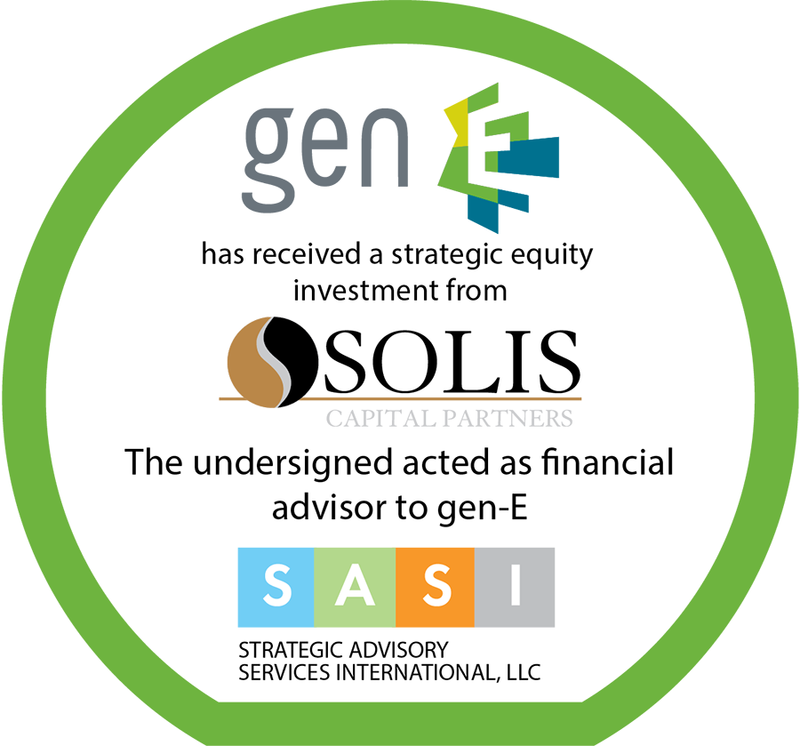 Strategic Advisory Services International, LLC (SASI) is pleased to announce that gen-E has received a private equity investment from Solis Capital Partners. SASI served as exclusive financial advisor to gen-E. The terms of the transaction were not disclosed. SASI advised gen-E on a range of strategic options which ultimately led to the private equity investment by Solis Capital Partners. SASI identified, screened and approached leading private equity firms and drove the negotiation and due diligence process. Keys to success included understanding and conveying gen-E’s growth strategy, identifying the right private equity partners and driving the negotiation process to a mutually beneficial outcome. SASI was founded on the belief that stakeholders in private technology companies demand a higher level of M&A service. Our clients seek an advisor that not only brings M&A expertise but also has significant industry, market and technology insights. Equally important, they want an advisor who knows and understands strategic buyers and can engage them at the appropriate levels.